WHO IS BURIED IN THE OLD KILLOUGH CEMETERY? ISAAC KILLOUGH , Sr., b. 1772, SC. Patriarch of the family, 66 yrs. old; died in the Massacre, 5 OCT 1838. Son NATHANIEL KILLOUGH, 58 yrs. old, d. 15 APRIL 1894. Stepson of Nathaniel, WILLIAM H. McKEE, about 21 years old; d. 19 FEB 1864. Gr. Grandson of Nathaniel, RAY KILLOUGH COULSON, 80 years old; d. 1990. Gr. Granddau. of Nathaniel, CARRIE AVON COULSON CLAYTON, 77 years old; d. 23 JUNE 1989. Carrie’s husband WILLIS DANIEL CLAYTON, about 62 yrs. old; d. 3 JUNE 1966. Gr. Granddau. of Nathaniel, MARION MARCELLA COULSON, 80 years old; d. 4 APRIL 1994. Granddau. of Nathaniel, ANNIE LEE McCARTY, infant, d. early 1880’s. Son ISAAC KILLOUGH, Jr., age unknown but probably in his 20’s, died in the Massacre, 5 OCT 1838. Son SAMUEL KILLOUGH, about 23 yrs. old; died in the Massacre, 5 OCT 1838. Isaac Byars, nephew of Isaac Killough, Sr., fifty four years old. Died in 1869 in Texas. He was the son of Martha "Patsy" Killough, Isaac's oldest daughter, whose family did not go to Texas with the rest of the family. 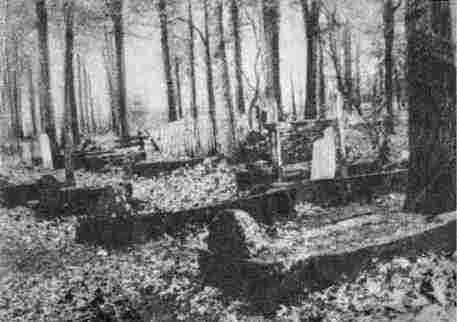 A photograph made before 1933 of the burial place of the remains of those in the massacre seems to contain six or seven burial plots with rock or wooden headstones. In the list above, William H. McKee, Annie Lee McCarty, Nathaniel Killough and Willis Clayton are the only known persons buried there, besides the massacre victims, before 1989. Those after that are buried in a far corner of the cemetery, side by side, and are brother and sisters. Sometime after the Kickapoo battle ( 14 OCT 1848) a detachment of men (Texas Army), led by General Rusk and guided by Nathaniel Killough came to the scene of the massacre and gathered up the bodies of the victims and buried them under a large oak tree. The remains of only a few could be found. Middleton (John W., of the Texas Army) indicated he was among a detail of men sent to the settlement of the Keelers (Killoughs) and the Williams to bury the victims of the massacre. He gave the number of victims found as four. They were buried in wooden boxes. It is not known whether wild animals carried off the bodies of some family members or if the Indians carried them off alive. It was the experience of the white men who fought the Indians that all men were killed and the women taken away to become part of the Indian tribe. It is said that a son of Mr. Wood was adopted by the tribe and finally became its chief. No official list of the victims has been found. From the Probate Court Minutes one learns that Isaac, Sr., Isaac Jr., Allen and Samuel Killough and George W. Wood (husband of Jane Killough) were killed. Barakias Williams (fiancé of Elizabeth Killough) is also known to have been shot. Elizabeth Killough (Barakias’ fiancé), Elizabeth Williams (dau. of Mary “Polly” Killough), Mrs. Allen Killough (Elizabeth) and Mrs. George W. Wood (Jane Killough) are known to have been missing. The author has found no official record of the names and the number of the Allen Killough and Wood children. Families involved said Allen and Elizabeth Killough had two or three children and that George Wood and Jane (Killough) had five. That accounts for 18 victims.